Me and my ECW gear, expecting to fly the first time! One month after my first post and I have finally traveled halfway around the globe to McMurdo Station! The trip was long but well worth it. I started my journey in Fairbanks, AK at 5AM last Saturday and traveled for just over 33 hours to Christchurch, NZ. Along the way, each flight contained more and more Antarctic researchers, and I was lucky enough to be seated next to another one of us on the trans-Pacific flight and the Auckland to Christchurch flight (though you couldn't spit without hitting a scientist on that one!). Once in Christchurch, we had a bit of time to explore the city, though most of us were fairly tired and jetlagged. 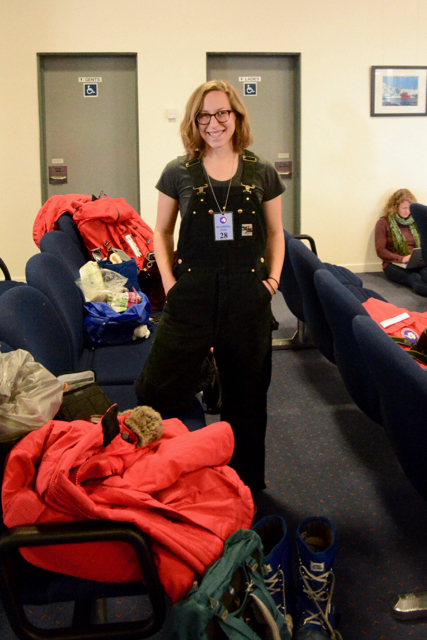 The next morning we visited the CDC (the Clothing Distribution Center) where we had our laptops checked to make sure they would be secure enough to connect to the McMurdo network, listened to a travel brief, and then picked up our ECW (extreme cold weather) gear. I wore my "big red" for the first time, and made sure my giant FDX boots fit. Once we had tried on all our things, we packed up our bags. One of our checked bags was our "boomerang" bag. Sometimes a flight will have to turn around or "boomerang" about 2/3 of the way to McMurdo if the weather is not suitable to land (they don't have the fuel to wait for the weather to turn after an 8 hour flight). The "boomerang" bag is all you get back if this occurs. When we finished up at the CDC, we headed back out to Christchurch to do some exploring. I visited the Re-Start mall, which is an outdoor mall made from shipping containers that was created in response to the destruction of the 2011 earthquake. I explored the shops and got lunch from one of the food trucks there. It was a beautiful 70 degree day so I sat down next to the river to eat. I also walked through the lush, green botanic gardens and saw people tubing and kayaking down the river. What a stark contrast to a Fairbanks winter! So warm and green in Christchurch! The next day we were set for a morning take-off, but received a notice that our flight was delayed. We arrived at the CDC mid-morning to check our bags and sit in the waiting room until more news came through. Unfortunately, our flight would not take off due to the weather at McMurdo. We were all a bit disappointed, but happy that we were not "boomeranging" and could enjoy Christchurch some more. The next morning we had an early flight time, so we boarded a shuttle to the CDC at 4:45AM. When we got to the CDC, we found out that our flight had once again been delayed, and no one was there to let us in yet. We waited at the curb for a little while and then headed through to check-in once more. This time we were able to make it onto our Safair plane, which is quite luxurious compared to the traditional C-130's that US researchers generally fly down on. We had real airline seats, though leg space was virtually non-existent. We had amazing views of the sea ice and Queen Victoria Land as we got close to McMurdo. The pilot even allowed us to cycle through the cockpit to take photos out of the larger windows. We all had to put on our goggles or sunglasses in order to see since the snow was such a blinding white, and I struggled while trying to capture photos through the somewhat dirty, glare-y windows. Original photo - So bright! Edited to enhance the amazing landscape! When we arrived, we were bused in to "town" and had an immediate briefing in the Crary library. Then, we were issued our dorm keys and office key cards and sent away for the night. I visited the "gerbil gym" to get out some energy after the flight and then went to bed. Since then, I have spent most of my time in town, but did make it to the "ob tube" and Scott base (our kiwi next-door neighbors). The "ob tube" is a way down under the sea ice, where you can view the ice from below, check out tiny little fish, and see things living on the ocean floor. It was incredible! My favorite part was the beautiful, needle-like frazil ice. We are hoping to get out to the West Antarctic Ice Sheet (WAIS) Divide camp soon, perhaps on Wednesday, but we should know more by tomorrow. Almost every time we mention that we are heading to WAIS Divide we get a response like "you think you're going to WAIS Divide". It is notorious for bad weather. Maybe we'll get lucky?! A close up of the frazil ice. I loved the colors! It reminded me a bit of a desert sunset. Rachel and Elena goof around while waiting at the ob tube. Who says scientists are serious? Selfie in the ob tube! My name is Emilie Sinkler and I am a graduate student in glaciology at the University of Alaska Fairbanks. This (northern) winter, I have the opportunity to conduct research at the West Antarctic Ice Sheet Divide camp. It will be my first trip to Antarctica, and my first trip to the southern hemisphere! I will leave Fairbanks at the end of November and spend 2 days in transit (thanks international date line!) before arriving in Christchurch, NZ. Here, I will make sure all of my personal gear is in order before getting on a plane to McMurdo Station, the US base on the Ross Ice Shelf. Then, my team will get on a plane that will take us to our field site where we expect to spend about 3 weeks collecting data before beginning the return trip. I plan to blog frequently once my trip has begun. I will share personal experiences, photos, and the details regarding the science we will be conducting. I will also be sharing interesting historical tid-bits, focusing on the history of women in Antarctic science and exploration. If you are interested in learning more about our trip, visit our team blog.